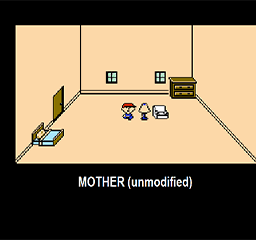 This is a very simple patch that reverts any modified graphics for on-world character sprites (including Ninten and party, town and city NPCs, etc) back to the base game’s original sprites. This patch is an addendum to the Mother 25th Anniversary Edition and Mother 25th Faithful Edition hacks, as well as any future hacks that modify the character sprites specifically. The patch will apply to any modified or unmodified file with no conflicts, as it only overwrites a small portion of graphical data. 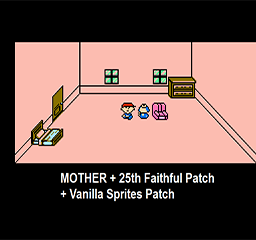 Be sure to apply this patch after any patches that modify character sprites, such as the Anniversary or Faithful hacks. Fixed a few more text errors and typos. If you are encountering trouble with sprites or text with v1.0 or v1.01, please apply v1.02 to remedy those issues.